Entering the final night of the NBA season, the Denver Nuggets’ playoff fate rested on multiple variables. Thanks to Jamal Murray and good fortune in Portland, they’re sitting on the No. 2 seed with a potential matchup against the Golden State Warriors or Houston Rockets that won’t happen until the Western Conference Finals. The Nuggets entered the night in control of their own path. With the best record among the teams fighting for the No. 2 seed, a win at home over the Minnesota Timberwolves was all they needed to seal the deal. But the short-handed Timberwolves playing without Karl Anthony-Towns were game to play spoiler, mounting a 95-93 lead in the game’s final minute. With less than 40 seconds to play, the Nuggets scrambled for a shot, and Will Barton’s go-ahead attempt clanged off the front of the rim. But Murray, standing behind the 3-point line, corralled the long rebound and did not hesitate to put up another shot. His stroke was pure, and it gave the Nuggets a 96-95 lead with 31.5 seconds remaining. 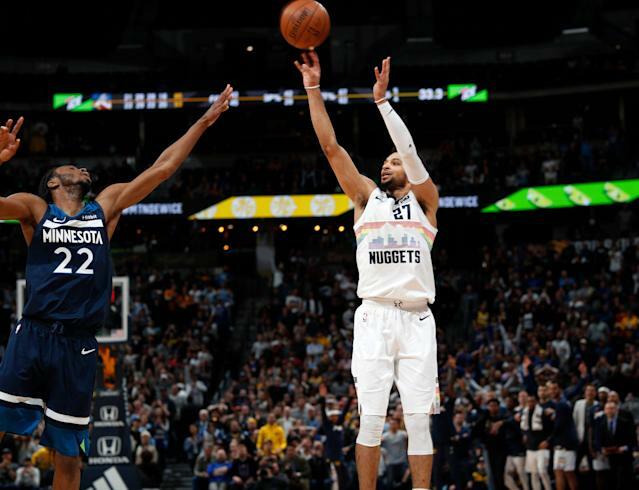 The Timberwolves would not score again as the Nuggets secured a 99-95 victory that ensured home-court advantage through the first two rounds of the playoffs. Had they lost, the Nuggets would have dropped to the No. 3 seed and faced a potential second-round matchup with the Houston Rockets, who have the tiebreaker in the season series and have defeated Denver three times this season. Instead, the Rockets fall to the No. 4 seed, thanks to a late Portland Trail Blazers rally over the Sacramento Kings. Houston and Portland both finish at 53-29 with Portland holding the tiebreaker. It’s a best-case scenario for the Nuggets, who lost three out of four regular-season games against the Rockets and wouldn’t have matched up well in a second-round series with Houston holding home-court advantage. The Nuggets will host the San Antonio Spurs in the first round of the playoffs.